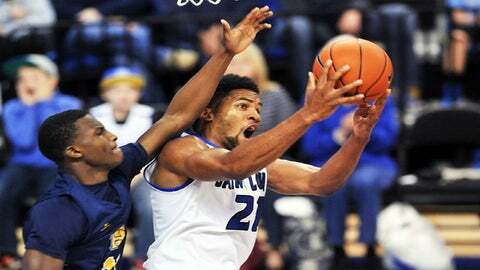 A dominant Dwayne Evans -- with 22 points and 13 rebounds -- helped lead the Billikens to their fifth straight victory. ST. LOUIS Dwayne Evans scored 22 points and grabbed 13 rebounds as Saint Louis won its fifth straight with a 79-57 victory over North Carolina A&T Saturday. Evans made two free throws to give Saint Louis (11-2) a 10-8 lead, and the Billikens led the rest of the way. Evans hit another pair of free throws to stretch the lead to 50-30 with 16:13 remaining. Saint Louis never led by less than 17 points in the second half. Evans was coming off a season-high 24 points Wednesday night against Indiana State. Mike McCall Jr. hit two 3-pointers in a row and scored 13 points. He has 1,004 career points, and becomes the 29th Billiken to surpass 1,000. Lamont Middleton made two free throws to pull North Carolina A&T (3-9) within 17 points, 59-42 with 9:11 remaining. Middleton was 8 of 11 from the line and scored 18 points to lead the Aggies.